Laurey (Lydia Hiller) and Curley (Tim Van Riper) tease each other. 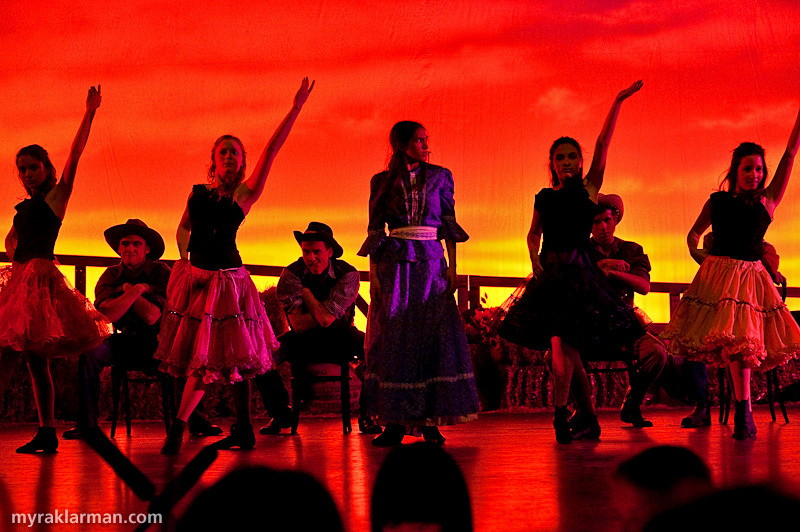 While I was shooting the final dress rehearsal for the Pioneer Theatre Guild’s production of Oklahoma!, I was continuously amazed by the quality of the lighting design. The light defined and highlighted each cast member on stage. But more than being merely technically superb, the lighting established its own thematic presence — conveying mood, time-of-day, dreams. Breathtaking! Truly, the entire production is stunning. Most definitely worthy of excellent light. I’m so glad I could be there to capture it. 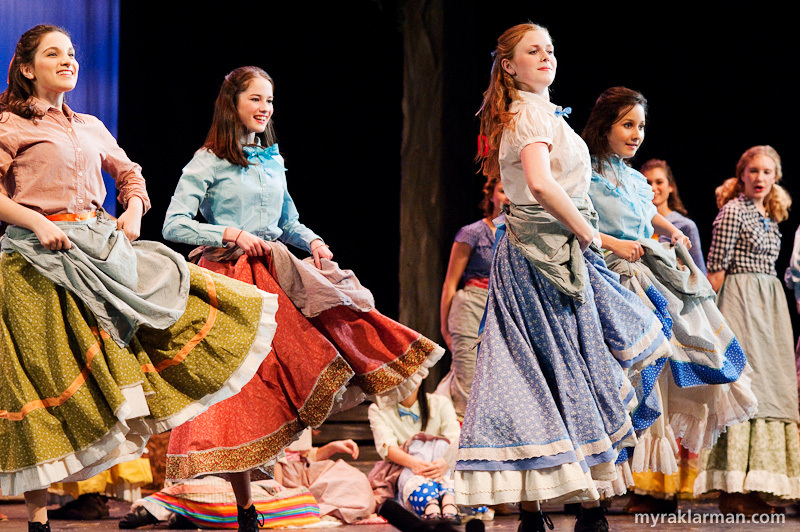 All performances will be in Schreiber Auditorium at Ann Arbor’s Pioneer High School. 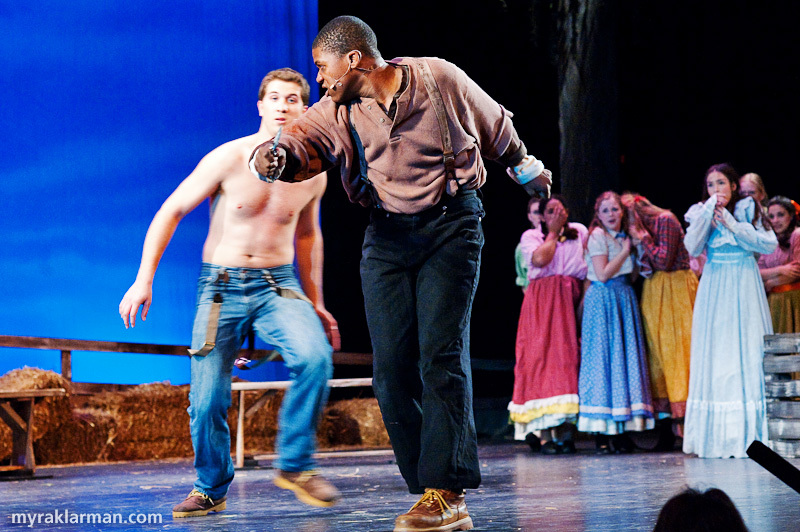 More info on the Pioneer Theatre Guild and the current season. The boys enjoy a close look at one of Will’s souvenirs from Kanses. 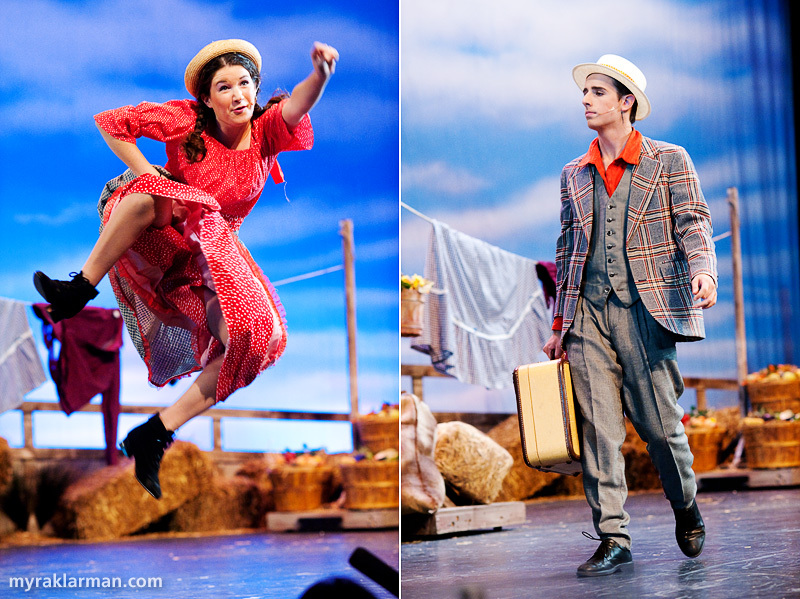 Ado Annie (Maia Gleason) is giddy over the men in her life. | One of those men is the unscrupulous Ali Hakim (Leo Bayless-Hall), a Persian traveling peddler. 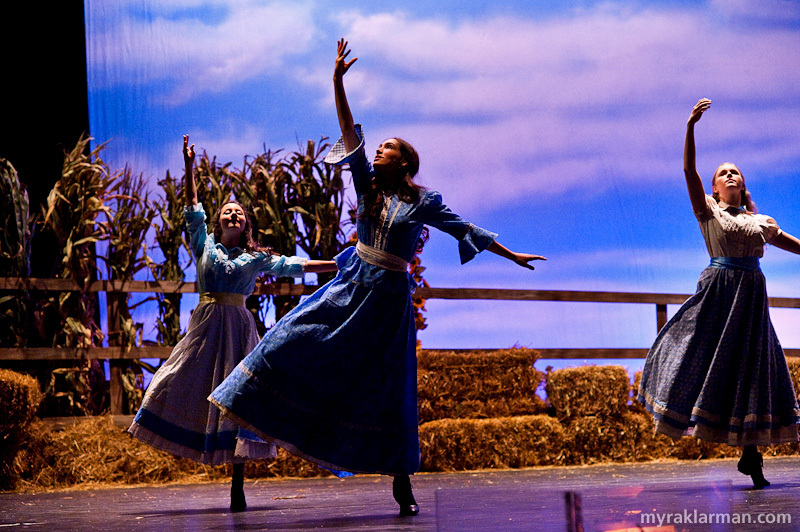 Beautiful dancing led by co–dance captain Beth Lloyd (third from the left). 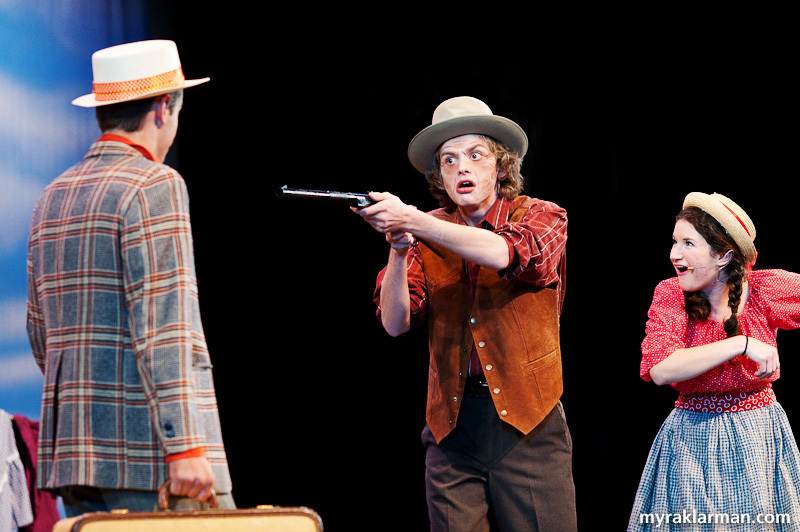 Mr. Carnes (Daniel Mozurkewich) forces Ali Hakim to marry his daughter, Ado Annie, at gunpoint. 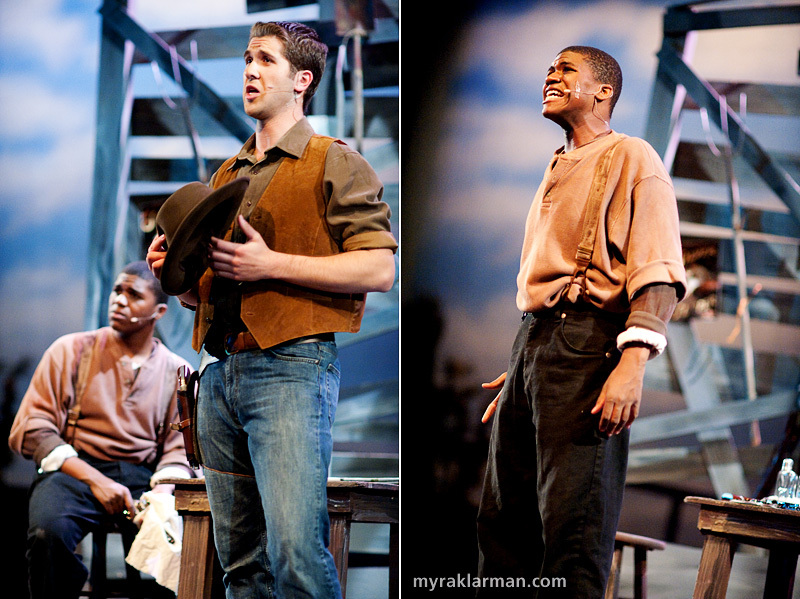 Curley and Jud (John Spalding) in the smokehouse wax melancholic about Jud finally being appreciated — at his funeral. | Jud is desperate for a woman of his own. The beginning of the Dream Sequence: gorgeous dancing and lighting. 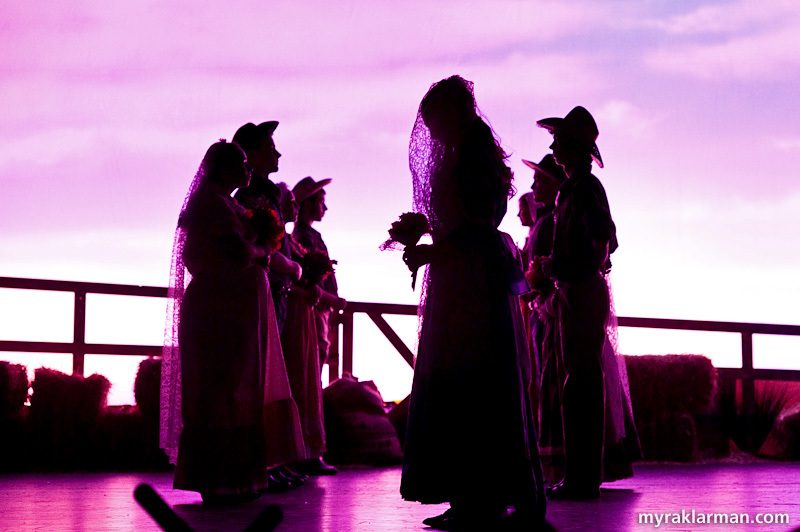 Dream sequence: Laurey awaits Curley at the wedding altar. Dream sequence: Laurey is aghast at how women are objectified in Jud’s world. 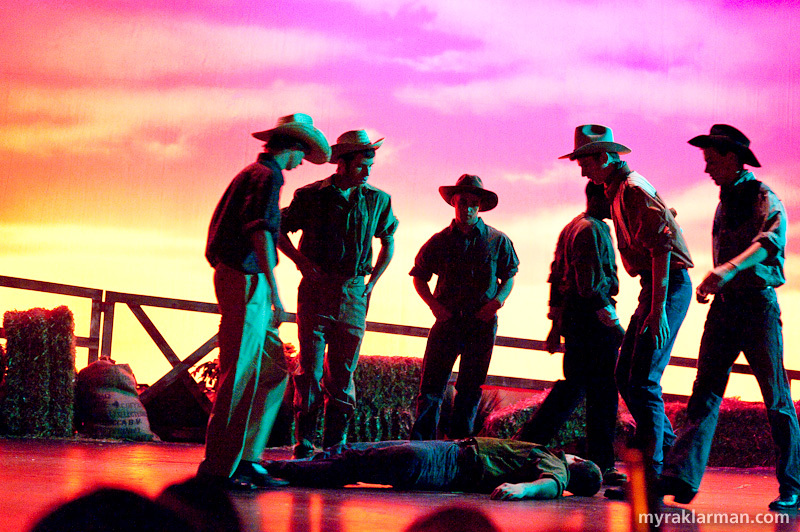 Dream sequence: Curley is dead after a fight with Jud. 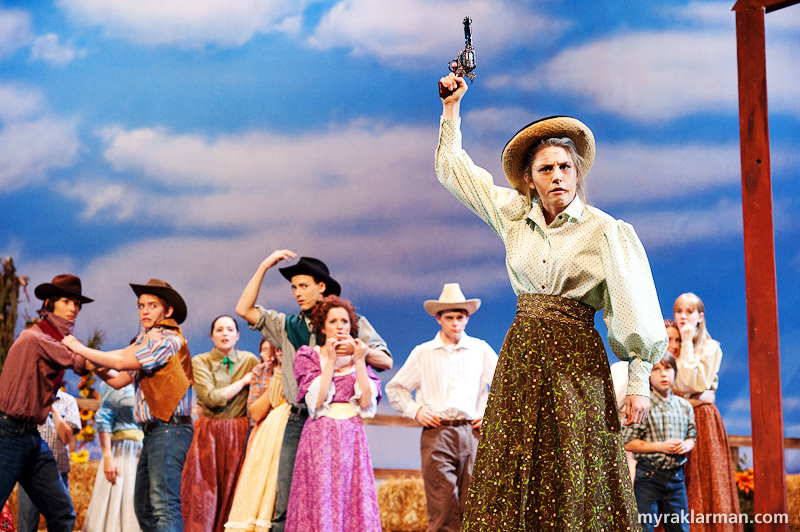 Aunt Eller (Emily Steward) imposes peace between the cowboys and the farmers. Laurey’s picnic lunch triggers a bidding war. 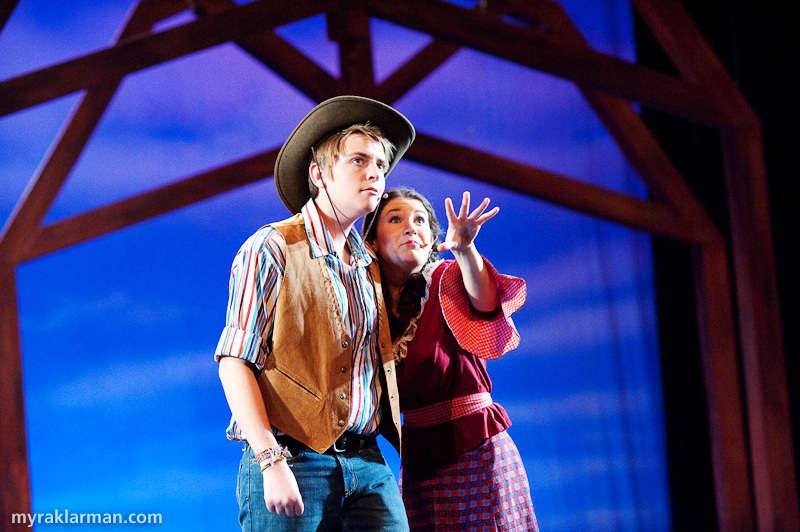 Will (Schuyler Robinson) and Ado Annie argue over the ground rules for their relationship. The final showdown: Jud’s got a knife! 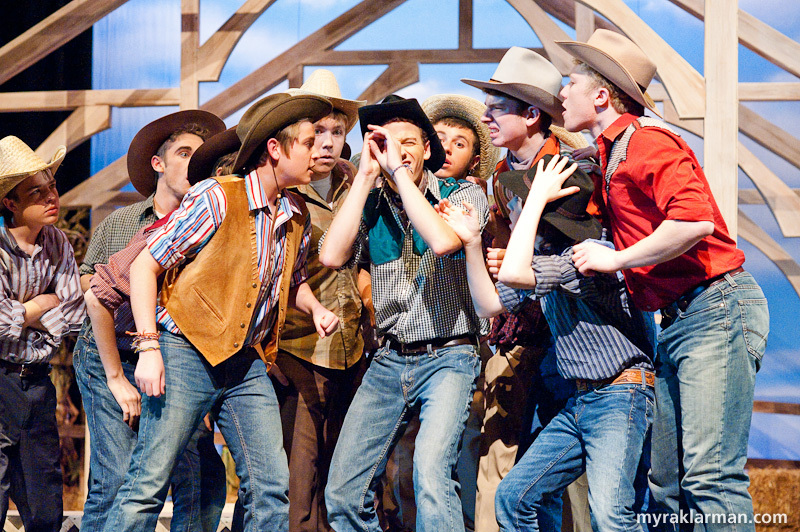 The ensemble included several cowboys-in-training — i.e., younger siblings of Theatre Guild members. Visited the lovely town of Ann Arbor for the first time last weekend. 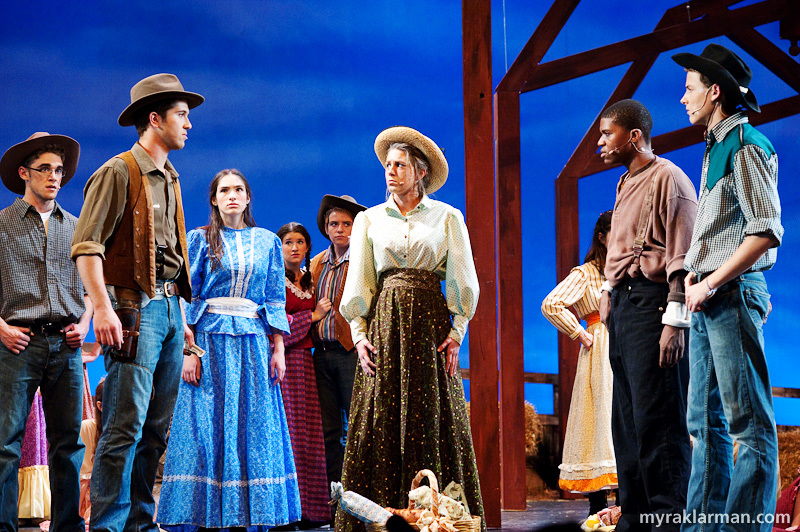 Attended the Saturday, November 14th presentation of Oklahoma. Our family really enjoyed the play. The students put on a show that we would expect to see from high budget professional troupes. 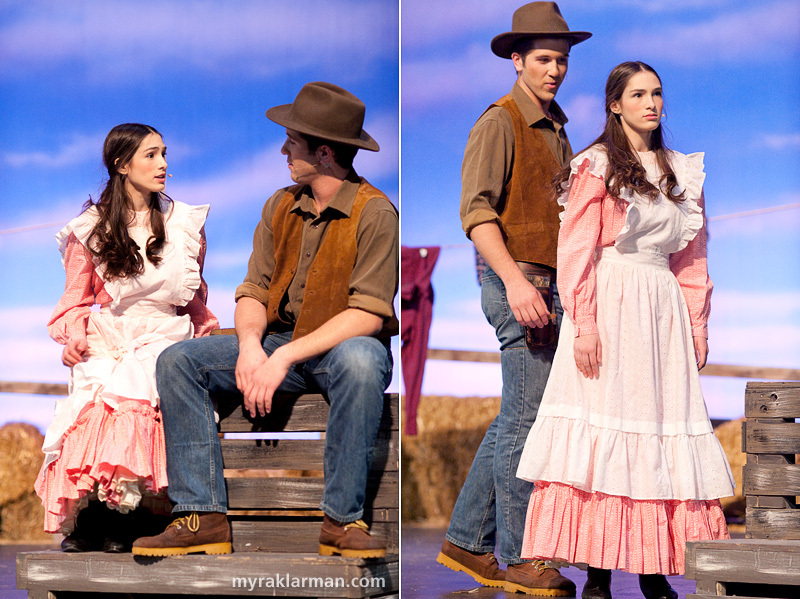 Pioneer High School should be very proud of all their students who helped to make this production go off so smoothly.